The Design Studio by Azza Fahmy has been selected to represent Egypt at Poland's Silver Schools exhibition. Silver Schools is part of a festival held this year in Legnica, Poland from 25 April to 10 June, and its main event is the Legnica International Jeweller competition. Comprising lectures, seminars and exhibitions, Silver Schools has been held annually since its launch in 2000, and aims to showcase the talents of different jewellery schools worldwide. Also participating in the festival are jewellery schools from Hildesheim, Germany and Vilnius, Lithuania. 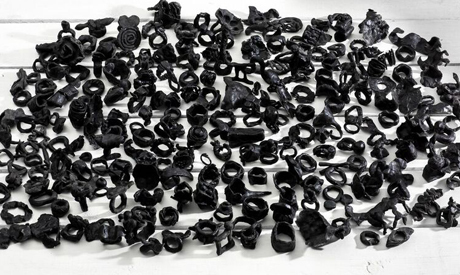 The title of the show is "Three Rings," and it is made up of three main parts; an interactive installation of black wax rings inviting visitors to add their own, a video installation, and finally a series of rings,each corresponding with a book which explains the inspiration behind the ring’s design. More than half a century ago, the Cairo-based Fahmy ventured as an apprentice intothe male-dominated workshops of Khan El-Khalili, learning all about the centuries-old craft of jewellery making. She then started her workshop with a handful of workers, aiming to tell stories of heritage and culture through her creations, before she launched her own line and eventually became one of the most well-known of all Egyptian jewellery designers. She has since collaborated with famous names on the catwalk, including renowned designer Mathew Williamson in 2013. Fahmy is now known worldwide not only for designs that rely heavily on research, but also on Ottoman techniques of organising craftsmen. In her workshop, craftsmen are ranked in three categories according to experience; the master (osta), the handy man (snaiei), and the young workers (sabi), and through this system the skills are preserved and passed on.